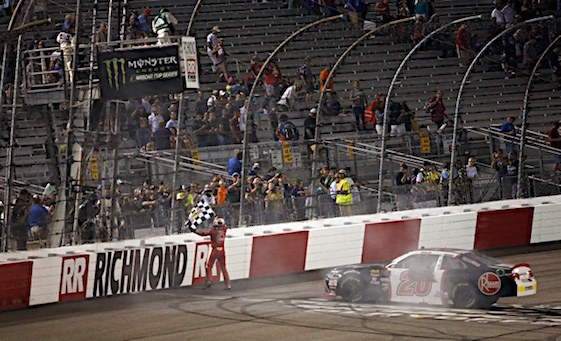 Christopher Bell captured Friday night’s NASCAR Xfinity Series playoffs race at Richmond International Raceway. In a race that featured Dale Earnhardt Jr. leading the most laps in his only scheduled race of 2018, Bell surged past leader Matt Tifft after a restart on Lap 237 of 250 and pulled away to beat Ross Chastain to the finish line by .566 seconds. (1) Christopher Bell # (P), Toyota, 250. (3) Ross Chastain (P), Chevrolet, 250. (6) Daniel Hemric (P), Chevrolet, 250. (2) Dale Earnhardt Jr, Chevrolet, 250. (10) Matt Tifft (P), Chevrolet, 250. (13) Elliott Sadler (P), Chevrolet, 250. (14) Tyler Reddick # (P), Chevrolet, 250. (9) Brandon Jones (P), Toyota, 250. (8) Shane Lee, Chevrolet, 250. (21) Ryan Reed (P), Ford, 250. (7) Ryan Truex (P), Chevrolet, 250. (16) Spencer Gallagher, Chevrolet, 250. (11) Austin Cindric # (P), Ford, 250. (17) Michael Annett, Chevrolet, 250. (4) Cole Custer (P), Ford, 250. (20) Jeremy Clements, Chevrolet, 250. (18) Ryan Sieg, Chevrolet, 250. (12) Ryan Preece, Toyota, 250. (22) Mason Diaz, Chevrolet, 250. (27) David Starr, Chevrolet, 249. (19) Alex Labbe #, Chevrolet, 248. (23) Joey Gase, Chevrolet, 248. (26) Ray Black II, Chevrolet, 248. (29) Garrett Smithley, Chevrolet, 248. (28) JJ Yeley, Chevrolet, 246. (34) Chad Finchum #, Toyota, 245. (25) Matt Mills #, Chevrolet, 244. (32) Katherine Legge, Chevrolet, 242. (31) Bayley Currey, Toyota, 242. (39) Josh Bilicki #, Toyota, 242. (24) Quin Houff, Chevrolet, 231. (5) Justin Allgaier (P), Chevrolet, Accident, 226. (30) Spencer Boyd #, Chevrolet, Accident, 160. (15) Ty Majeski, Ford, Accident, 145. (38) Mike Harmon, Chevrolet, Overheating, 122. (40) Carl Long, Dodge, Overheating, 98. (37) Vinnie Miller #, Chevrolet, Engine, 91. (36) Timmy Hill, Toyota, Electrical, 85. (35) Jeff Green, Chevrolet, Vibration, 28. (33) Morgan Shepherd, Chevrolet, Handling, 22. Average Speed of Race Winner: 91.352 mph. Time of Race: 02 Hrs, 03 Mins, 09 Secs. Margin of Victory: 0.566 Seconds. Caution Flags: 5 for 40 laps. Lap Leaders: C. Bell # (P) 1-7; J. Allgaier (P) 8-34; C. Bell # (P) 35; J. Allgaier (P) 36-45; D. Hemric (P) 46-79; C. Bell # (P) 80-123; D. Earnhardt Jr 124-152; C. Bell # (P) 153; D. Earnhardt Jr 154-220; D. Hemric (P) 221; M. Tifft (P) 222-236; C. Bell # (P) 237-250. Leaders Summary (Driver, Times Lead, Laps Led): D. Earnhardt Jr 2 times for 96 laps; C. Bell # (P) 5 times for 67 laps; J. Allgaier (P) 2 times for 37 laps; D. Hemric (P) 2 times for 35 laps; M. Tifft (P) 1 time for 15 laps.